Glamorgan have signed South African international fast bowler Wayne Parnell as their second overseas player for the T20 Blast. Parnell, 25, has played four Tests, 46 one-day internationals and 33 T20 matches for the Proteas. The left-arm seamer has previously played for Kent and Sussex. "I'm very excited about the prospect of joining up with [fellow South Africans] Jacques Rudolph and Colin Ingram and playing for Glamorgan," said Parnell. "T20 cricket has been a strength for Glamorgan and I'm keen to contribute to a successful campaign." South Africa batsman Ingram has already joined the Welsh county as their first overseas signing of the season. Parnell's move to Glamorgan is subject to clearance from Cricket South Africa and a successful visa application. He is due to arrive in Wales ahead of Glamorgan's T20 Blast fixture against Surrey at the Oval on Friday, 15 May. Parnell, who has played for Delhi Daredevils in the Indian Premier League, will be available for an initial spell of 10 group stage fixtures ending against Somerset at Taunton on 28 June. "We are delighted to have secured the services of Wayne Parnell, who was earmarked at a young age as one of South Africa's brightest talents and who is a naturally gifted all-rounder," said Glamorgan chief executive Hugh Morris. 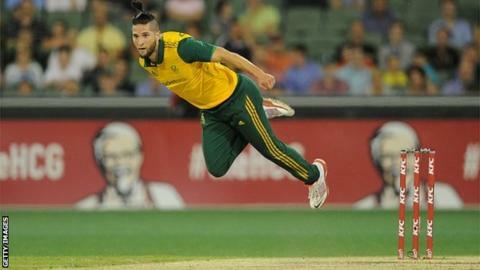 "He will give us a wicket-taking threat and also the potential for valuable runs. "Even more importantly, Wayne is available to us for the vast majority of our T20 Blast group games and we will re-visit discussions around a potential extension as the competition unfolds."